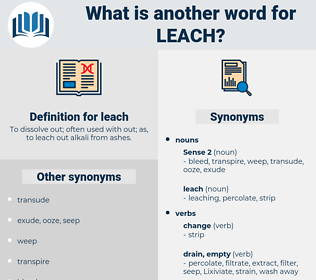 What is another word for leach? To dissolve out; often used with out; as, to leach out alkali from ashes.
" Then I: If thou not hear me, I shall die, Yea, in my desperate mood may lift my hand And do myself a hurt no leach can mend; For poets ever were of dark resolve, And swift stern deed " That maiden heard no more, But spike: Alas! He made his way along the yard, and with his knife cut the leach - rope; and though many a shot from the Frenchmen was fired at him, he came down safely. 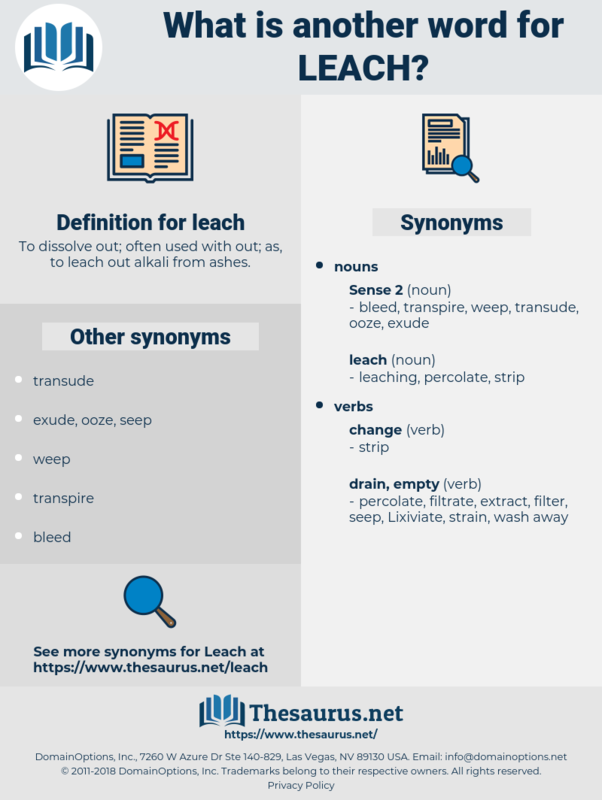 lasso, leakey, liege, lychee, lug, leacock, laws, Leo Esaki, lasix, lallygag, lush, lachesis, lakh, leak, lichi, lucas, lycia, lucy, lochia, louse, leo xiii, lechwe, lace, Lake Cayuga, lilylike, lugosi, lock, lewisia, lhasa, lacy, lexis, laos, llullaillaco, likewise, lock away, lazy, loess, log z's, luck, leaky, laius, luke, leg, logo, Louis Ix, lash, lek, like, leuciscus, Lugh, lie awake, logic, lxxxi, lagos, louche, lxxiii, Louis X, Louis Xii, lxxxiii, logy, lazio, Louis Iii, loss, lassa, loos, locke, loco, lox, lag, loggia, lick, laicize, lac, leech, Liliaceae, lass, luce, leggy, legacy, leigh, lxii, laic, lygus, leitch, lawless, loose, Louis I, laugh away, lichee, lxxi, lewis, look away, Louis XI, Louis Xiii, lake, luggage, lxx, lockage, leetch, lxxx, luxe, Louis Agassiz, lxxxii, lac wax, less, louis, Lech, laugh, Louis Ii, lucky, loge, lysis, loki, lxi, legs, loligo, lisu, lycosa, lough, low-key, liliaceous, luge, lilac, lyssa, Lego, loch, lao-zi, lx, loasaceae, league, lease, leechee, lollygag, lycee, leash, laicise, loach, lockjaw, luik, lux, lousy, luscious, Leo X, leek, loquacious, lake keuka, lack, lessee, lassie, lees, loloish, loasa, leakage, lossy, leo ix, laze, loxia, liaise, liliales, lxiii, lxxii, logos, lackey, locus, lose, look, lascaux, losses, lachaise, log, lax, Lusaka, liza. action, activity, natural action, natural process.